There are so many awesome group sewing events on the inter webs these days it makes my head spin. One of my very favorites is the Have Company Dress Along. I love it because it's VERY loosely organized, and totally my speed. Every couple of months Marlee chooses a new pattern for instagrammers to sew along with. She started with a simple sleeveless trapeze dress (here's mine), and each progressive pattern adds one new skill. The Scout Tee started in July, with the addition of set in sleeves. I am no beginner, but I'm still sewing along for the company. When I'm sewing something this simple, I like to customize it a bit. The Nani Iro double gauze fabric has a seamless finish at the selvedge, and an unusually large space between the print and the edge. Sometimes this annoys me, but for this simple dot print and simple top design, I decided to use the gap in the finished garment to add a bit of detail to the sleeves edges. I love this simple detail, but it's always a bit of a downer when you realize you're not the only person who ever thought of it. Reana Louise used the same pattern, and same print, with a more interesting variation. I also admire the restrained simplicity of Katie's chambray scout, and I'm definitely going to try the split neck tutorial on the Grainline blog. 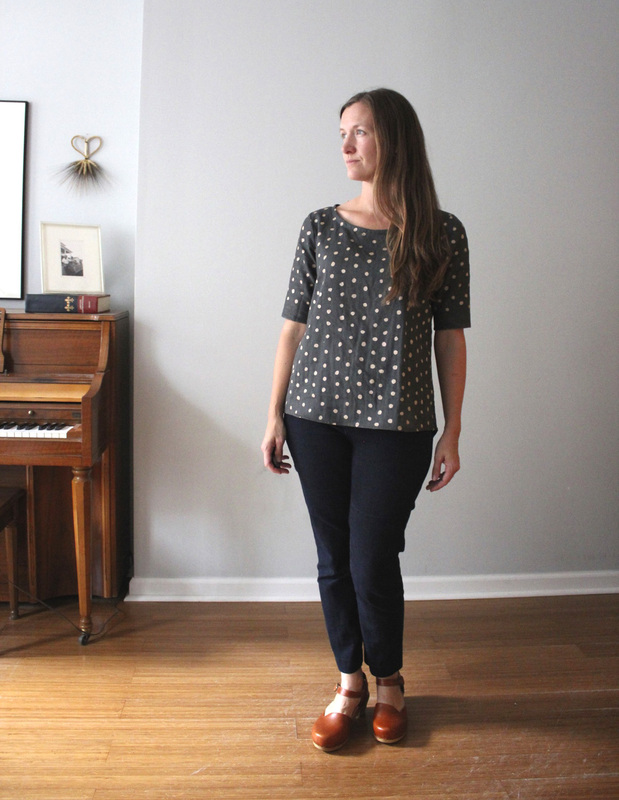 PATTERN: Scout Tee by Grainine Studio. This pattern is one of my top 10 sewing basics. It has a set in sleeve and a scoop neck. It's kind of like a bodice block, and with that you can make anything. FABRIC: Nani Iro Pocho double gauze in olive/gold from Imagine Gnats. Double gauze is perfect for this simple pattern, and I love the subtle metallic dot pattern. SIZE/FIT: As usual I cut 3 sizes, from 6 at the bust to 10 at the hip. I'm pretty happy with the overall fit. ALTERATIONS: The alterations are many. I raised the neckline 1", and made it 1" wider on each side, and lengthened the sleeve to the elbow. 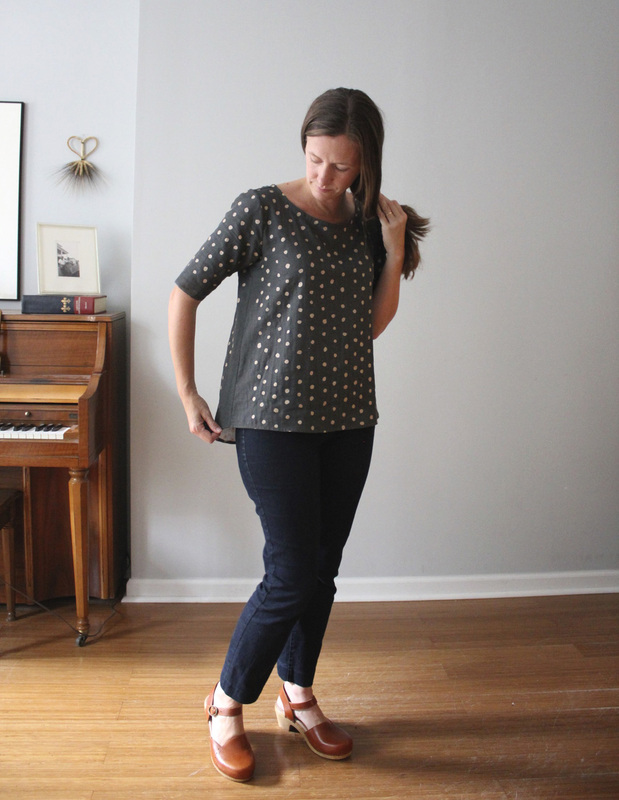 I used the Tiny Pocket Tank hemline as a guide for this shirt tail hem variation, because I anticipate wanting to tuck it in. My tardiness in blogging this project has allowed me to catch the tail end of Selfish Sewing Week, and very beginning of Slow Fashion October. Anyone else participating in Slow Fashion October? More on my plans next week. Selfish Sewing Post On Kollabora. Gosh that Scout was like my second-ever sewing project. I've actually just recreated a very similar one now that I actually know what I'm doing! Love how you placed the pattern here and I'd wear the heck out of it. Ha! I'm WAY behind the cool kids too. I really didn't think I would like this top on me. Once again, I forgot that if I make it myself it will fit! 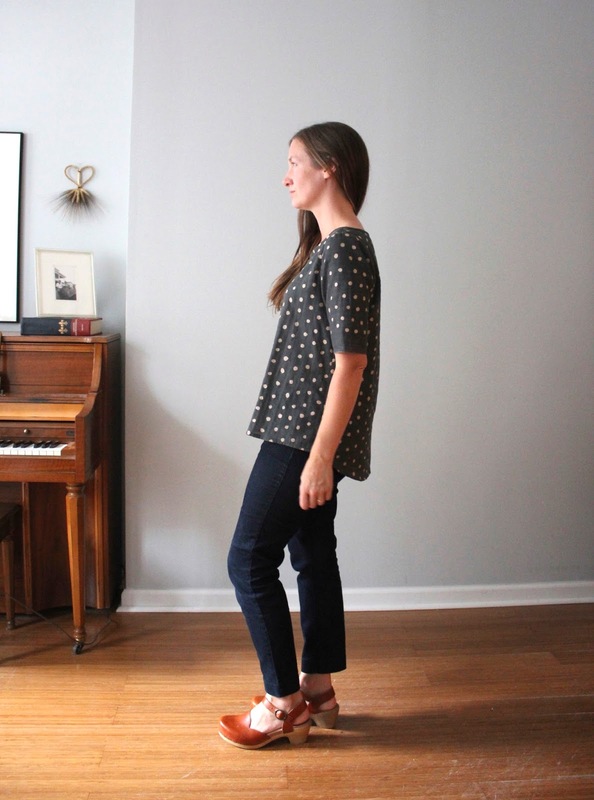 I really love how you used the fabric selvedge on this one! You took a basic pattern and gave it a just the right amount of oomph. Note to self: copy Kristi's "bit of contrast" bias binding technique on my next project. I just love the way this turned out. Such pretty fabric and your placement is perfect. You say that you added 1" to the sides. I'm guessing that you started at the underarms after the seam allowance and flared out 1" from the bottom hemline. Is this right? Love this!! And so does my friend Martine!